”Is that a café that offers buffet?” My friend asked. I was stunned for a moment, thinking if my pronunciation is that bad. But on second thought, Boufe DOES sound like buffet. 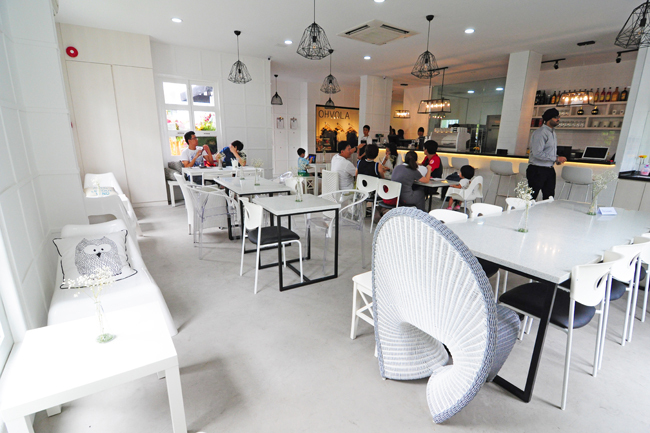 Boufe originates from 2 words; namely BOUtique and caFÉ. Combine the two and you will see them in reality, a boutique for the women (Ohvola) in a café setting. 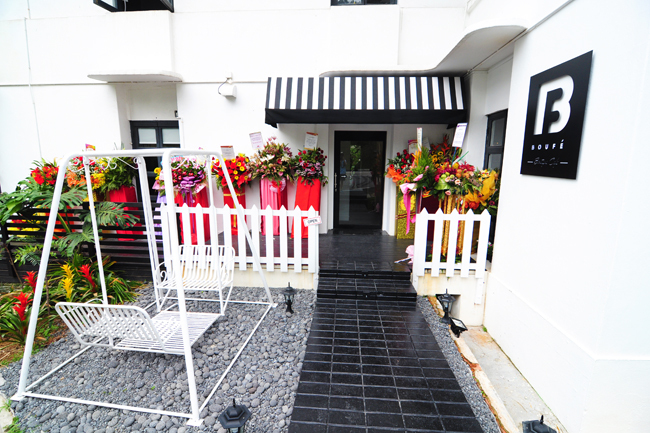 Situated within Phoenix Park along Tanglin Road, Boufe is located right at the furthest end away from the entrance. We heard… you could hitch a ride from the security guards with a buggy at the entrance to anywhere within the compound, if you are a girl. The men don’t get it. We (the guys) ended up getting ‘bochap-ed’ by the guards, and decided to walk in ourselves. The buildings within Phoenix Park pretty much retained the looks since the British colonial rule in Singapore. Within Boufe, they took a minimalist interior approach; simple, clean, white and sufficient natural lighting in the daytime (instagrammers alert). 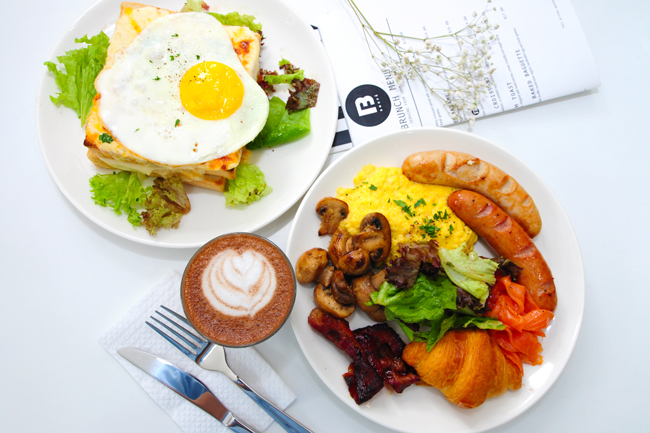 They offered brunch menu item from 10am to 3pm with recommended dishes such as Triple B ($21 nett) that stands for Boufe’s Big Breakfast and Eggs Benedict ($16 nett). The kitchen closes at 3pm before resuming at 6pm till 10pm for their dinner menu items. Prawn Aglio Olio ($20 nett) and Old Fashioned Beef Stew ($26 nett) are some of the recommended dinner items. All prices are nett. We ordered The Triple B ($21 nett) that came with a little of everything on a single plate. 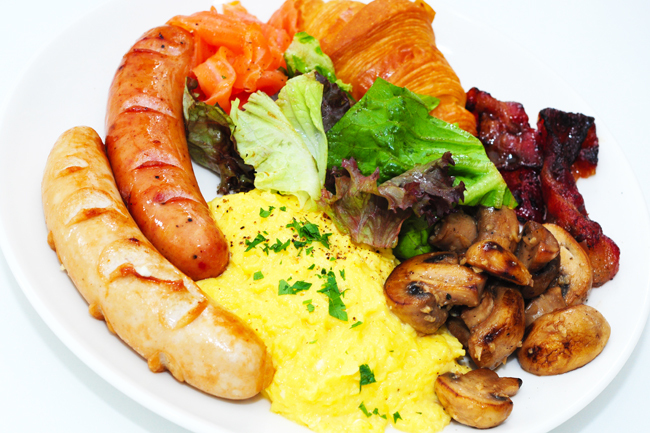 Those luxurious- looking runny scrambled eggs outshone the rest and captured my attention. The streaky bacon left a deeper impression with its crispy honey glazed coating and ba kwa (barbequed pork) taste. 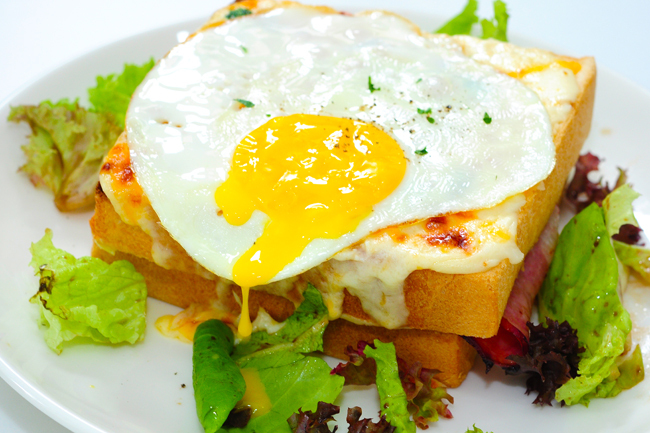 The Classic Croque Madame ($19 nett) came with ham and cheese sandwich with a sunny-side up on top. Even though the sandwich was pretty thick, they were fluffy and soft. I wished, they would have more mornay sauce to go with it. 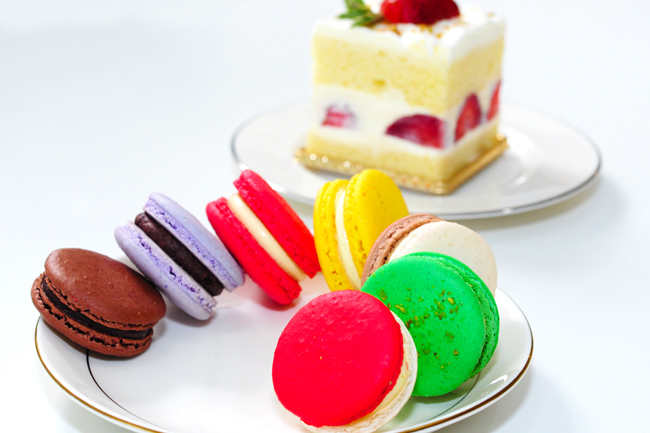 The pastries were freshly baked in house daily. 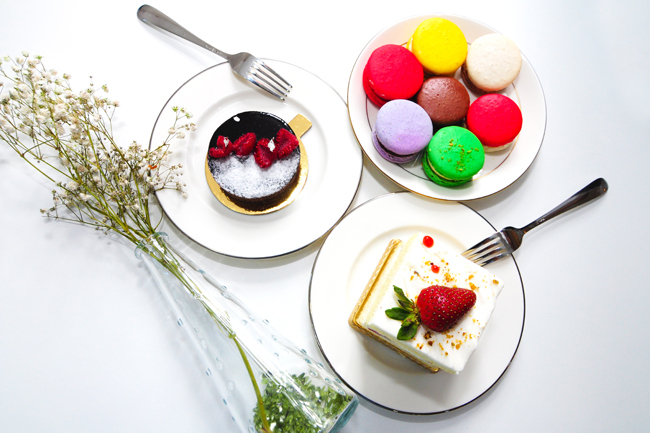 Their selection includes croissant ($3.50), chocolate and citron tart ($5.50 each), tiramisu ($6.50) and strawberry shortcake ($8). Since we can’t decide on which flavour to try, we decided to go with one of each of their macarons ($3.30 each) selection. The ones that stood out for us were the pistachio flavour and chocolate macaron with tiny chocolate balls in their ganache filling with an added crunch. 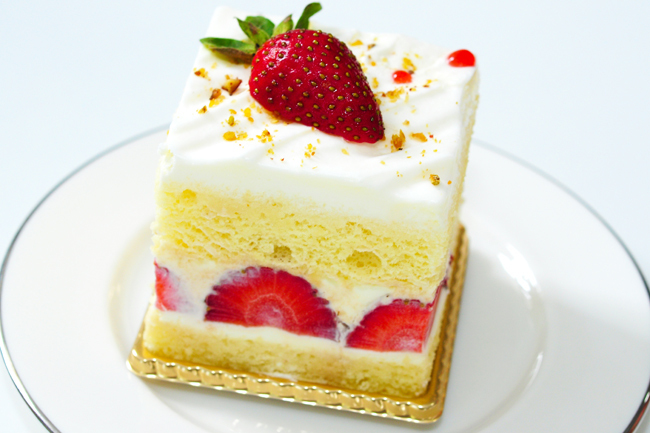 The Strawberry Shortcake ($8 nett), the most expensive item on their pastry menu, was probably a dollar more expensive than elsewhere. Pretty decent, I would say, and maybe not memorable. 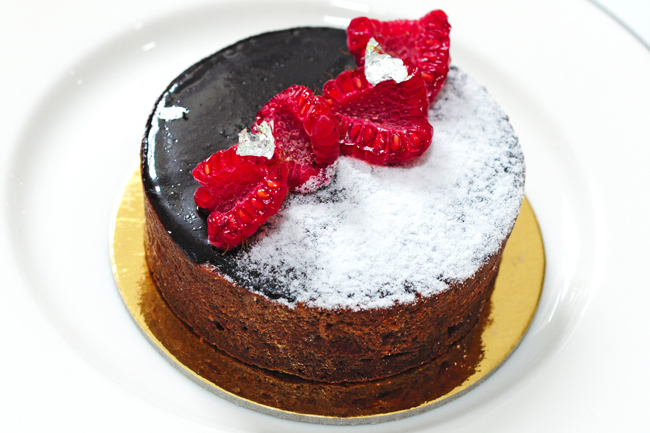 The Chocolate Tart ($5.50) had the most interesting looks among the pastries. It resembled much of the colours of the café interior, mainly black and white, and also shaped the ‘yin-yang’ logo in Taoism. Interestingly, the tart filling was made up of 3 separate layers: dark chocolate for the top, milk chocolate for the middle and peanut butter for the bottom layer. Hopefully my teeth wont get 3 different colour stains after eating this. 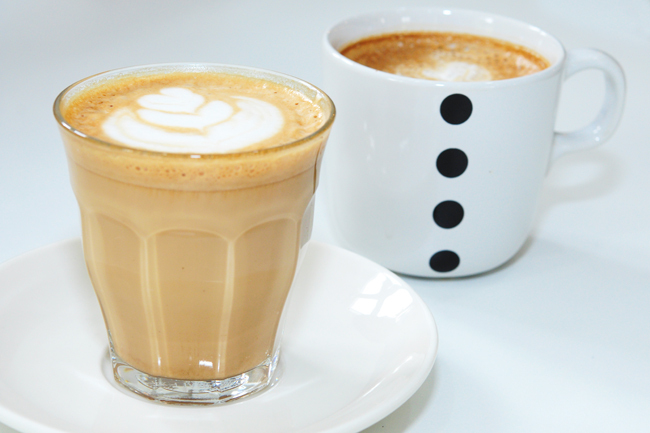 A cup of Flat White or Latte will cost $4.80 whereas flavoured latte such as vanilla, hazelnut or caramel will cost $5.50. Boufe brunch menu is indeed promising and decent. Sorry guys, no buffet here, save the money for the ladies to spend at Ohvola Boutique, while sipping your coffee at the café and monitoring their expenses from far. For the ladies, Ohvola Boutique will be having their weekly online launches on every Monday , showcased at the cafe every Friday before. Meaning to say Boufe will have new dresses, outfits and accessories every week. We wish they can say the same about their desserts.